So I’m at a pagan spring party in South London, talking to the nice doctor lady. For some reason or other I mention kittenwar, and her eyes light up. She tells me that the only reason that hospital staff are able to stay awake during marathon shifts is because they’re playing on the site. Then she asks for my autograph. 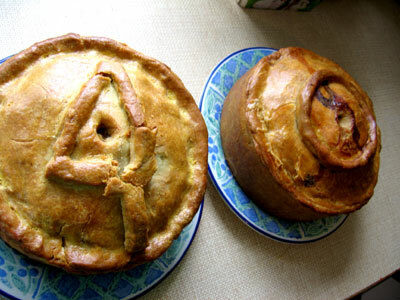 I marked my 40th birthday by cooking up a couple of gargantuan pork pies. These meaty beasts each contain fifteen pounds worth of prime English pork and Spanish pancetta, plus the usual smattering of herbs and spices (sage, thyme, peppers white and black, mace and a smidgen of chili powder). The most interesting thing about the celebrations, however, was how neatly pigeonholed people have me. Of the 15 birthday cards I received, 11 featured pictures of cats and kittens, while the bulk of my presents were food related, apart from the two cat-a-pult sets I received from completely different people: scorpion vodka, weasel coffee, foie gras, several very nice bottles of wine (including one of 1966 vintage) a personally signed copy of HFW’s River Cottage Diary, a lovely set of crockery, and a wonderful chocolate recipe book from Green & Blacks. Given that today I seriously considered spending £85 on a sandwich, then probably. Given that tomorrow I’m going to eat in a pitch-black restaurant with blind waiters, then definitely.